The government of India, through the Indian Council of Agriculture Research (ICAR), recognized the contributions of R.K. Singh in the development of the first salt-tolerant Basmati rice variety, Basmati CSR30, in a ceremony held in New Delhi on 16 July 2013. Dr. Singh is a senior scientist at IRRI’s Plant Breeding, Genetics, and Biotechnology (PBGB) division. He co-developed Basmati CSR30 with B. Mishra while working with him at the Central Soil Salinity Research Institute (CSSRI) in Karnal, India, before joining IRRI. For the past two days, members of the Neighborhood Emergency Services Team (NEST) teams in various barangays in Los Banos and Bay have been actively monitoring flood and erosion situations, providing hourly feedback on the heavy downpour caused by Typhoon Maring and the Habagat (monsoon) rains. They have also been helping bring affected families in Barangay Lalakay to an evacuation center. 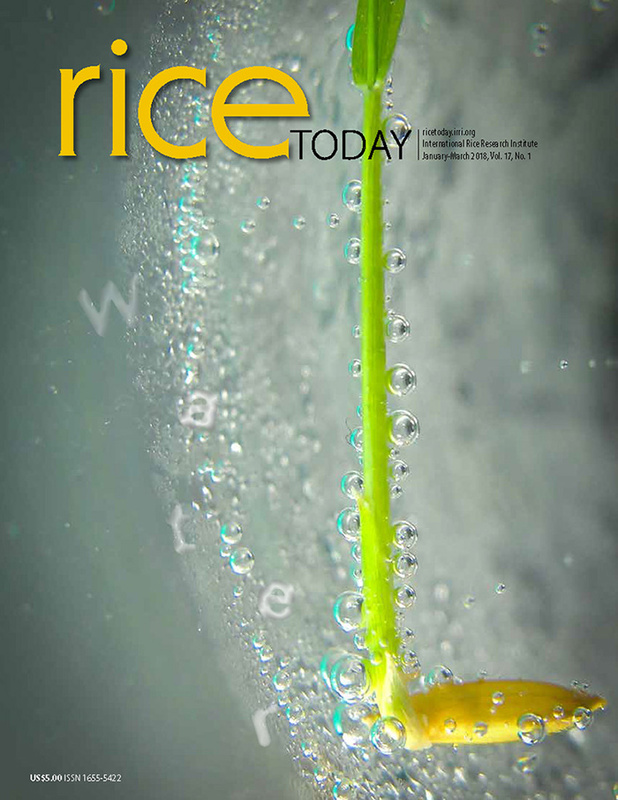 The 23rd issue of RIPPLE features the Closing Rice Yield Gaps in Asia (CORIGAP) Project, which takes off from the success of the Irrigated Rice Research Consortium (IRRC). The new CORIGAP project builds on partnerships and linkages formed by the IRRC in six partner-countries—Indonesia, Myanmar, Sri Lanka, Thailand, China, and Vietnam. CORIGAP’s goal is to sustainably increase rice yield by 10% by 2016 in three major rice granaries and by 20% by 2022 in six granaries for 500,000 smallholder farmers. IRRI’s Analytical Service Laboratory (ASL) recently received its new PAO ISO 17025 certificates for maintaining its accreditation after the Philippine Accreditation Office (PAO) conducted its third yearly surveillance visit. A workshop that sought to sustain awareness and strengthen seed production of stress-tolerant rice varieties (STRVs) was held at the Indian Chamber of Commerce in Kolkata, West Bengal, India, on 2 August 2013. The inception and planning meeting for the BMZ-supported project, Increasing productivity of direct-seeded rice areas by incorporating genes for tolerance of anaerobic conditions during germination, was held at IRRI on 13–14 August 2013. The BMZ-supported project provides IRRI an opportunity to better understand the mechanisms underlying tolerance of anaerobic germination (AG) stress in order to develop rice varieties that can survive flooded conditions right after sowing, and to test improved crop management practices in direct-seeded conditions. The event, held on 5–8 August 2013, was the first major output of a multi-year project by APEC that began this year to address losses from food processing and elsewhere along the supply chain. It was attended by 120 participants from the APEC Secretariat and 18 member-economies. While the Mekong Delta remains a major rice-producing region, other areas in Vietnam must not be left behind in efforts to improve the quality of the country’s rice exports through improved postharvest technologies. A seminar on rice postharvest and laser-leveling for the northern, central, and highland regions of Vietnam was held on 30–31 July 2013 in Quang Ngai Province. IRRI marked its first-ever Women in Rice Farming Day on 8 August 2013 to recognize the role of women in agriculture, particularly in rice farming. The event was attended by 213 participants from the national and local governments including the Philippine legislature, the academe, media, NGOs, and the private sector. After the successful observance of Nutrition Month in the Philippines, IRRI’s deputy director general for communication and partnerships V. Bruce J. Tolentino called on fellow Filipinos to rally against malnutrition and support the quest for solutions to help solve vitamin A deficiency. He explained that Golden Rice is a new type of rice that contains beta-carotene (a source of vitamin A) that IRRI is developing with the Philippines as a potential new way to reduce vitamin A deficiency and improve nutrition among rice consumers, especially women and children. An international training-workshop on the characterization of rice-growing environments was held on 24–26 July 2013 in Kathmandu, Nepal. The workshop, joined by 35 participants, aimed to facilitate the dissemination of stress-tolerant varieties in the region.